CHICAGO – In our latest edition of HollywoodChicago.com Hookup: Film, we have 40 admit-two passes (note: this was increased on Tuesday from 25 due to popular demand) up for grabs to the Chicago screening of “Traitor,” which stars Don Cheadle, Guy Pearce and Jeff Daniels. The movie was filmed in part in Chicago. To win your free pass to the advance screening of “Traitor” in Chicago courtesy of HollywoodChicago.com, all you need to do is be one of the first 40 people to submit a comment in this HollywoodChicago.com Hookup. That’s it! The screening will be held on Aug. 25, 2008 at 7 p.m. in downtown Chicago. Directions to enter this HollywoodChicago.com Hookup and immediately win can be found beneath the graphic below. 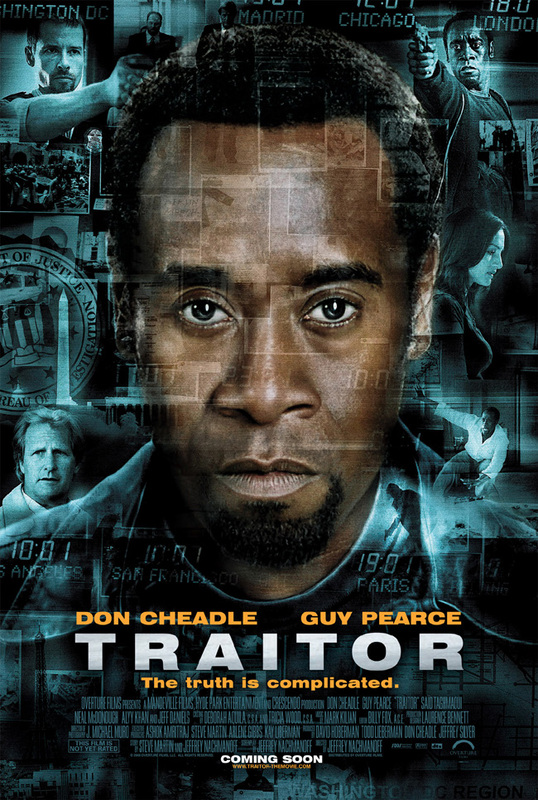 “Traitor” features Don Cheadle, Guy Pearce, Jeff Daniels and Neal McDonough. When strait-arrow FBI agent Roy Clayton (Guy Pearce) heads up the investigation into a dangerous international conspiracy, all clues seem to lead back to former U.S. special operations officer Samir Horn (Don Cheadle). A mysterious figure with a web of connections to terrorist organizations, Horn has a knack for emerging on the scene just as a major operation goes down. The task force links Horn to a prison break in Yemen, a bombing in Nice and a raid in London, but a tangle of contradictory evidence emerges. This forces Clayton to question whether his quarry is a disaffected former military operative or something much more complicated. To secure your free tickets now, make sure you’re logged into your HollywoodChicago.com account. If you don’t yet have one, you can quickly register here. Having an account with a valid e-mail address is required. What was the last dishonest thing you did? Like all Hookups here, this HollywoodChicago.com Hookup: Film is simple: The first 40 people to comment below win! We will be in touch with the 40 winners to confirm your passes. “Traitor” opens on Aug. 27, 2008. Submitted by Jenna Zizzo (not verified) on August 11, 2008 - 1:48pm. I work at a bar, and a couple weeks ago a woman gave me what she thought was a five dollar bill to pay for a 3 dollar drink and she said keep the change. What she didn’t realize was that it was actually a 50 dollar bill…and I never told her once I did realize it. oops. Submitted by Sox on August 11, 2008 - 2:05pm. Submitted by BR (not verified) on August 11, 2008 - 2:14pm. Submitted by Kevin (not verified) on August 11, 2008 - 2:15pm. Took a two and a half hour lunch at work and only signed out for thirty minutes.. Submitted by bicycleboy on August 11, 2008 - 2:19pm. Submitted by mybluebug on August 11, 2008 - 2:28pm. Submitted by Beegee on August 11, 2008 - 2:44pm. Submitted by Paul (not verified) on August 11, 2008 - 2:44pm. I said I was sick, but really, I was just irritated. Submitted by Jason (not verified) on August 11, 2008 - 3:03pm. Excellent cast and interesting concept. Submitted by moviefan508 on August 11, 2008 - 3:29pm.